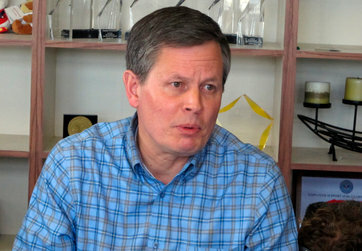 WASHINGTON — To Representative Steve Daines, Republican of Montana, his vote this month against a 1,582-page, $1.1 trillion spending bill was at once a stand for fiscal sanity and a protest against spending cuts to rural communities, a “constructive no,” as he put it last week. His opponents in the race for Montana’s open Senate seat quickly labeled it a vote against increased funding for the Indian Health Service, Pell Grants for low-income college students, mental health benefits for veterans and traumatic brain injury assistance for those who fought in Iraq and Afghanistan, as well as an effort to dry up the clean water supplies of rural Montanans. The attacks on that one vote from Montana Democrats, including a possible challenger in Lt. Gov. John Walsh, highlighted a vulnerability to the Republicans’ quest for control of the Senate: They draw heavily from the unpopular House for candidates. Republicans start this election year with the strongest hand they have had since 2010: a Democratic president with weak approval ratings, an economy still struggling to spread the benefits of a slow recovery, the disastrous rollout of President Obama’s health care law, contested races for six Democratically held Senate seats in states carried by Mitt Romney, and the historical pattern that the party controlling the White House loses seats in a second midterm. But to take control of the Senate, Republicans need to net six seats, and they will probably need to do it with candidates currently serving in House seats in Montana, Louisiana, Arkansas, West Virginia and Georgia. In 2012, Republicans fielded House members or former House members in Senate contests in North Dakota, Montana, Missouri, Florida, Michigan, New Mexico and Arizona. Six of them lost, including Denny Rehberg in Montana, Rick Berg in North Dakota, and Todd Akin in Missouri, three races Republicans had thought were likely pickups. In contrast, five of the six House Democrats seeking a seat in the upper chamber in 2012 won. This time around, Republicans say they simply have better candidates in a much better environment. “I spent 28 years in business prior to getting involved in politics a couple of years ago, and learned some principles: Keep your skin thick and your heart tender,” Mr. Daines said with a shrug. They say this year will be more like 2010, when Representatives Mark S. Kirk of Illinois, Roy Blunt of Missouri and John Boozman of Arkansas cruised to Senate victories. To keep the Senate, Democrats must prove that wrong — and tar House Republicans seeking to jump to the upper chamber with the sins of a Congress with record low approval ratings. The approach is not going to work, said David Ray, communications director for the Cotton campaign. The effort to sully House Republicans has already begun. An advertisement funded by the Senate Majority PAC intones, “In Louisiana, we expect leaders to solve problems,” with an aerial shot of the countryside. The voice-over continues, “not become part of the problem,” as the image switches to the House floor and Representative Bill Cassidy, the Republican hoping to challenge the re-election of Senator Mary L. Landrieu, a Democrat. The ad then hangs the October government shutdown and House-approved budget cuts to Medicare around the neck of Mr. Cassidy, a three-term House veteran. “Cassidy has to be Washington, Landrieu has to be Louisiana, or we lose this race,” said a Democratic strategist involved in the campaign. Democratic strategists say similar lines of attack will be coming against Mr. Daines in Montana, and Representative Shelley Moore Capito in West Virginia, a favorite to take the seat of Senator John D. Rockefeller IV, a Democrat who is retiring. Democrats are also stockpiling ammunition in expectations that either Phil Gingrey, Paul Broun or Jack Kingston — all House members — will emerge as the Republican nominee for the seat of Senator Saxby Chambliss of Georgia, a Republican who is retiring. “You can’t overstate the brand problem with the Republican House,” said Matt Canter, a spokesman for the Democratic Senatorial Campaign Committee. Of course, Democrats may stumble themselves. Ms. Landrieu was off message last week when she declined to attack Mr. Cassidy’s House record and instead said he had little record to show for his time in Washington. Republicans have their own bullets. As the Walsh campaign goes after Mr. Daines as a tool of the House Republican Conference, Lieutenant Governor Walsh is dealing with an Army reprimand that recently came to light for pressuring subordinates to join the National Guard Association of the United States, a lobbying organization, while he headed Montana’s National Guard in 2010. Meantime, sitting senators like Ms. Landrieu and Mr. Pryor are burdened with the low approval ratings of the president, a weight that is probably heavier in their Republican states than the unpopular Republican leadership. Mr. Obama’s approval rating in Arkansas stands at 36 percent, according to the latest Gallup poll. In West Virginia, it is 28 percent. Still, Republicans cannot get complacent, rerunning the 2010 playbook and simply attacking Mr. Obama and the health care law as they did in 2012, said Rob Jesmer, who led the Republican senatorial campaign that year. Rather, they will need a positive agenda to explain why they should take the Senate. A version of this article appears in print on January 30, 2014, on page A13 of the New York edition with the headline: Unpopularity of the House Could Turn Senate Races.